Please describe your role in one or two sentences: I’m leading a project that’s investigating strategies to scale up chronic disease prevention programs in community settings. 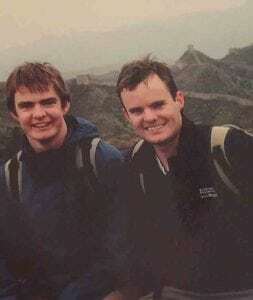 Luke Wolfenden with his brother Adam at the Great Wall of China. The most challenging part is … this work is all being done in the form of Cochrane Reviews. It’s a developing field and the literature is heterogeneous with new studies coming out every day. It’s challenging to synthesise it in a way that’s quick enough to be of benefit before it becomes redundant. I’m interested in the work of the Prevention Centre because … it’s one of the few centres internationally that brings together such a multidisciplinary team of people working in the field of implementation science. A lot of the work of the Prevention Centre is in systems science, an area I find intriguing. Before my current position, my most memorable role was … working on Hunter New England’s Good for Kids, Good for Life obesity prevention program in NSW, which was the first time we really applied implementation science methods to a public health problem at scale. My favourite holiday is … travelling overseas, though now I have kids you’re much more likely to find me in a holiday park. The things I most enjoy is … hanging out with my family, playing touch football in the park or going for a run. Read more about Luke here.